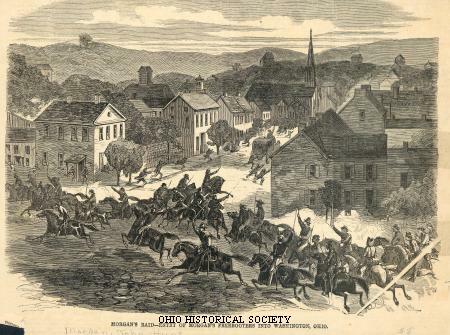 View of the entry of Morgan's Raiders into Washington, Ohio, from Harper's Weekly, Saturday, August 15, 1863. In July 1863 Confederate Brigadier General John Hunt Morgan lead approximately 1,400 cavalrymen on a 13 day raid through southern and eastern Ohio. At the Battle of Buffington Island, 750 men were captured and 300 escaped across the Ohio River. Morgan and 400 men headed north after the battle and were captured in Columbiana County, Ohio. Morgan's Raid, also known as the Indiana-Ohio Raid, the Great Raid, or the Ohio Raid, was the only major attack by Confederate forces on the state of Ohio during the American Civil War. On July 8, 1863, Brigadier General John Hunt Morgan, a Confederate cavalry leader, led approximately 2,100 soldiers across the Ohio River into southern Indiana. Morgan's superiors had dispatched the cavalry leader into Kentucky to divert Union troops from the front lines in Tennessee. Morgan exceeded these orders by crossing north of the Ohio River, but by doing so, he did create turmoil for the Union army and civilians. Crossing into Indiana, Morgan's Raiders spread false rumors that the Confederates intended to attack Indianapolis, Indiana. Rather than doing this, the men spent five days in southern Indiana, procuring supplies and horses from Union civilians. On the night of July 12, Ohio Governor David Tod issued a proclamation, calling out the Ohio militia to protect the southern counties from Morgan's Raiders. Many militiamen did not hear of the proclamation in a timely manner, but eventually 60,000 Ohioans responded to the call. On July 13, as 65,000 Indiana militia and soldiers descended upon Morgan's men, the Confederates entered Ohio at Harrison, 20 miles northwest of Cincinnati. Nearly 10,000 Ohio militiamen had gathered to defend Cincinnati and Hamilton. Morgan planned to evade them. In what would become America’s longest non-stop ride of a division of horsemen in enemy territory, Morgan led his cavalrymen through the outskirts of Cincinnati during the night of July 13-14 and fought a skirmish near the Union army's Camp Dennison before making camp at Williamsburg in Clermont County. The next day, Morgan divided his men. He sent a group through Georgetown to Ripley in Brown County, while the main force traveled through Mt. Orab and Sardinia, following the Highland-Brown County line to Winchester in Adams County. The two groups merged northeast of Cherry Fork in Adams County. Morgan’s reunited division rode through Locust Grove, crossed the Scioto River at Piketon, and proceeded to Jackson. There, the Confederates split again, with one brigade heading southeast through Vinton in Gallia County while the other brigade, accompanied by Morgan, rode directly east to Wilkesville in Vinton County. At Berlin Crossroads in Jackson County, Morgan defeated a group of 1,500 Ohio militiamen in a lively three-hour skirmish, while five miles northwest of Centerville, in Gallia County, a detachment of Michigan cavalrymen drove off the raiders in a brief encounter. In the early morning of July 18, the two brigades reunited at Hanesville in Meigs County and turned east toward Middleport in an effort to reach the Ohio River and cross into friendly territory. However, heavy enemy resistance from Ohio militiamen and Union soldiers near Middleport and Pomeroy convinced Morgan to head for the low-water ford at Buffington Island. At sunset on July 18, Morgan’s Confederates encountered a small earthwork defended by Ohio militiamen guarding the Buffington Island ford of the Ohio River. Severely outnumbered, the militiamen retreated under the cover of darkness. However, their presence, combined with an unusual flood of the Ohio River, delayed Morgan enough to allow Union cavalry to catch up to the Confederates. Brigadier General Edward H. Hobson and his Union cavalry division of 2,800 men had closely pursued Morgan from Kentucky. Union Major General Ambrose Burnside also had sent a Union cavalry brigade of 1,100 men under Brigadier General Henry M. Judah and several gunboats under Lieutenant Commander LeRoy Fitch up the Ohio River from Cincinnati toward Portsmouth. In addition, an infantry division under Brigadier General Eliakim P. Scammon traveled by steamboat from West Virginia to Gallipolis and Pomeroy to defend those towns. Some of these infantrymen had fought alongside the Ohio militia in the severe skirmish with Morgan’s division in the hills around Pomeroy. Among Scammon’s soldiers were Colonel Rutherford B. Hayes and Lieutenant William McKinley, Jr., future Presidents of the United States. Before dawn on July 19, Morgan's men attempted to ford the Ohio River at the head of Buffington Island. The Confederates succeeded in getting a small number of men across the river before two Union gunboats under Commander Fitch and 1,000 soldiers under General Judah appeared unexpectedly out of the thick fog around 5:30 AM. The Battle of Buffington Island ensued. The combined Union force numbered approximately 3,000 men, while Morgan's Raiders included 1,800 soldiers. Judah’s troopers were surprised and routed in the initial action, but the Union commander organized a successful counterattack that caused the Confederates to retreat a mile and a half upriver. By 6:30 AM, dismounted men from two brigades of General Hobson’s division attacked Morgan from the west, while Judah’s troopers fought the Confederates on foot from the south. Judah’s and Hobson’s artillery were especially effective and deadly throughout the battle. In addition, from the river Fitch’s two Union gunboats, USS Moose and Allegheny Belle, continually fired their cannons into the Confederates. It was too much for Morgan’s men to handle. Morgan formed an L-shaped defensive line as he ordered his rear troops to retreat northward. Hayes’s brigade of Scammon’s infantry arrived by steamboat at this time and acted as a reserve to Judah’s cavalry. Some uncertainty exists about the battle. Morgan did not file a battle report, and the Union officers involved left out many details in their final reports. Using multiple primary sources, the best data suggests that Morgan lost 57 killed, 63 wounded, and 71 captured on the battlefield. Among the captured was Morgan's brother-in-law, Colonel Basil Duke. During the twenty-four hours following the battle, Union soldiers captured an additional 570 men in eastern Meigs County, northeast Gallia County, and along the West Virginia shore of the Ohio River. Unfortunately, perhaps because Morgan’s Raid was very politically charged, Union records on July 20 exaggerated the number captured to be over 2,300 men – more than the Confederates had present in Ohio! Union forces lost six killed and twenty wounded men in the two-hour battle, including Major Daniel McCook of the Fighting McCooks. During the Civil War, fifteen McCook family members fought for the Union, earning these men the nickname the Fighting McCooks. Morgan's remaining men (about 1,100 of the 1,800 engaged) managed to escape from the battlefield and continued in a northerly direction along the Ohio River, hoping to find a place to cross. Twelve miles upstream from Buffington Island, Morgan's Raiders found an unprotected crossing at Reedsville in Meigs County. Over three hundred of the Confederates succeeded in crossing the river before Fitch’s Union gunboats arrived. Morgan and his remaining 800 soldiers retreated westward and southward through Meigs and Gallia counties and then moved in a more northeasterly direction through Vinton, Hocking, Athens, Perry, Morgan, Muskingum, Noble, Guernsey, Harrison, Jefferson, Carroll, and Columbiana counties. Along the way, Morgan fought Union soldiers and Ohio militia at Cheshire, Eagleport, Washington, and Wintersville. Although Morgan escaped from these skirmishes, he continued to lose men who could not keep up with his fast-moving column. Southwest of Salineville, in Columbiana County, Union cavalry under the command of Major W.B. Way engaged in a running battle with Morgan’s remaining 475 troopers. After an hour and half of fighting, the action around Salineville resulted in over one hundred Confederates killed, wounded, and captured, and less than twenty Union soldiers wounded. Three miles west of West Point in Columbiana County, Major G.W. Rue’s Union cavalry surrounded Morgan's Raiders and succeeded in capturing Morgan and 364 of his command. The surrender occurred at about 2 PM on July 26, 1863. Morgan's capture marked the end of his raid of the North. The Union soldiers took Morgan and most of his captured men to Cincinnati. The enlisted men were confined in the Camp Chase Confederate prison camp in Columbus, Camp Morton in Indianapolis, Camp Douglas in Chicago, and other prison camps in the North, while Morgan and sixty-eight of his officers were confined in the Ohio Penitentiary. Morgan arrived there on July 30th. He and several of his men immediately made plans to escape. Using table knives, they tunneled out of their cells into an airshaft in November 1863. They remained in their cells until the night of November 27, when Morgan and six of his officers, dressed in civilian clothes, utilized the airshaft to reach the prison yard. They then used a homemade grappling hook tied to a rope fashioned from their bed ticking and scaled the wall. Utilizing some money that had been smuggled into the prison, Morgan purchased a train ticket to Cincinnati. He then made his escape across the Ohio River into Kentucky. Morgan returned to the Confederate army but was killed by Union soldiers less than a year later at Greenville, Tennessee. Morgan's Raid netted few positive results for the Confederate military. The raid diverted over 100,000 Union troops from their normal duties for three weeks, which fulfilled the primary mission that the Confederate high command had given to Morgan. Many of these Union soldiers represented the bulk of General Burnside’s cavalry, which was critically needed for leading an advance into East Tennessee. The raid did provide some hope to Confederate civilians that their military could still succeed following the Union victories at Gettysburg and Vicksburg in early July 1863. It also caused fear among Indiana and Ohio residents and cost thousands of these people personal property that the raiders had seized. Almost 4,400 Ohioans filed claims for compensation with the federal government for items that they lost to the Confederates or to Union soldiers and militia during the raid. The claims amounted to $678,915, with the government authorizing compensation in the amount of $576,225. While the Confederates succeeded in instilling fear in the civilian population, the raid inspired many of these people to fight even harder to defeat the Confederacy. In addition, the Confederate military lost a large number of veteran cavalrymen. The raid caused no significant harm to the transportation and communication infrastructure of the Union. The Great Raid had as many negative effects as positive ones for the Confederacy. Cahill, Lora, and David L. Mowery. Morgan's Raid Across Ohio: The Civil War Guidebook of the John Hunt Morgan Heritage Trail. Columbus, OH:Cincinnati Historical Society, 2014. Duke, Basil Wilson. History of Morgan's Cavalry. Cincinnati, OH: Miami Print and Publishing Co., 1867. Basil W. ed. Morgan’s Indiana and Ohio Raid. In The Annals of the War Written by Leading Participants North and South. Edited by Alexander K. McClure, 241-256. Philadelphia: Times Publishing Company, 1879. Gray & Pape, Inc., Battle of Buffington Island Battlefield Preservation Plan, Lebanon Township, Meigs County, Ohio. Columbus, Ohio: Ohio Historical Society, 2006. Mowery, David L. Morgan’s Great Raid: The Remarkable Expedition from Kentucky to Ohio. Charleston, SC: History Press, 2013. Official Roster of the Soldiers of the State of Ohio in the War of Rebellion, 1861-1866. Akron, OH: The Werner Company, 1893. Ramage, James A. Rebel Raider: The Life of General John Hunt Morgan. Lexington: University Press of Kentucky, 1986. Reid, Whitelaw. Ohio in the War: Her Statesmen, Generals and Soldiers. Cincinnati, OH: Clarke, 1895. Robertson, Jonathan. Michigan in the War. Lansing, MI: W.S. George & Co., 1882. Senour, Faunt Le Roy. Morgan and His Captors. Cincinnati, OH: C.F. Vent, 1864. Thomas, Edison H. John Hunt Morgan and His Raiders. Lexington: University Press of Kentucky, 1975. U.S. War Department. War of the Rebellion: A Compilation of the Official Records of the Union and Confederate Armies. Ser. 1, Vol. 23, Pts. 1-2. Washington, DC: Government Printing Office, 1889. U.S. War Department. Official Records of the Union and Confederate Navies in the War of the Rebellion. Ser. 1, Vol. 25. Washington, DC: Government Printing Office, 1912.